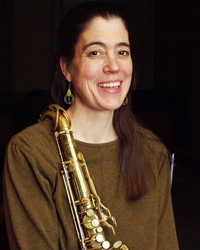 "I arrived in the Boston area as a teenager to attend Berklee College of Music as a flute performance major. I was an enthusiastic young musician without extensive training and I truly appreciated having the opportunity to study at a music college. This was in part due to the Berklee admission policy and in part due to my father's hard-earned savings. I practiced constantly and spent a great deal of time in the ensemble rooms, took great classes in arranging and ear training and loved every minute of it. By the time I completed my bachelors degree I had begun to double on the saxophone so I could vary the type of employment available to me. My first gigs were with a soul band, a Haitian dance band, and a Brazilian dance band. I enjoyed the traveling playing music allowed me to do. I have been to France, Martinique, Guadalupe, Venezuela and Columbia to play gigs. I began teaching private lessons in the after school program of the Needham public schools. Teaching has always been my favorite way to supplement my performing career. I went on to New England Conservatory to get my masters in saxophone performance. I enjoyed playing jazz there in the big band and with small ensembles but one of my most memorable experiences was performing in Jordan Hall with the Wind Ensemble. At present I play jazz and classical music mostly for functions, musicals and occasional club dates or concerts. I hope to play in more clubs again when my parenting responsibilities permit. I love all types of music. The comradery of music has always been important. It is a pleasure being around others who love what they do for a living."